In Memory of Rev. Clementa Pinckney, Tywanza Sanders, Cynthia Hurd, Rev. Sharonda Coleman-Singleton, Myra Thompson, Ethel Lance, Rev. Daniel Simmons, Rev. DePayne Middleton-Doctor and Susie Jackson. Several years ago, my family and I decided to drive down to Florida for a family vacation. As I was trying to map our course and figure out where to stay, I found myself looking up demographics and researching information about the towns that we would pass through on our way to Florida. I was also researching about the KKK, racist activities, and the like in the various towns we would potentially stop in. My husband laughed at me because he thought I was being silly and slightly paranoid. But my fear was real. I did not want to get stuck in a town where I would have to fear for my family’s life. To me, America was and is not safe. I could not trust that we would be safe. I could not trust because I look different. I am not white. I am Asian. No matter how I would alter my appearance or wear the right clothes or even speak perfect English, I could not pass for white. I am an outsider. IN MY OWN COUNTRY. But where did my trust go? Why do I feel that America is not safe? Take a look at history. I love history, especially American history. The ideals that this country stood for was highly appealing to me – a daughter of immigrants, who came to this country for a better life with infinite possibilities. But as I continued to learn more and more about American history, I also saw the terrible ugliness of it. I was told to “go back” to my country countless times. Sometimes it was said under breath and other times it was screamed out while rocks hurled from their hands. I remember my parents telling me that no matter how “American” I tried to be, I still would not be considered American if something were to happen like a war with an Asian country. Remember the Japanese internment during World War II? I desperately wished I was white. How else would I feel safe in America? How else would I fit in? How else would I stop being an outsider? More than 15 years ago, I drove cross country with my brother. We did our best to drive through as fast as we could through all the towns between Seattle, WA and Chicago, IL. Back then, I could not identify why we did that, but we both had a gut feeling that it would be “safer” to get to a bigger city where we wouldn’t stick out so much. This past Wednesday night, nine people were shot and killed at the Emanuel African Methodist Episcopal (AME) Church. One of the survivors was a 5 year old girl – she survived by pretending to be dead. My heart broke and wept over that because I could imagine her mother talking to her about playing dead if someone came in with a gun or how she would’ve told her daughter that America was not safe for her. Her mother probably never imagined that she would not be safe at her own church. Wake up, America. Terrorism doesn’t come from a faceless person overseas, it’s coming from your neighbor here, in America. Stop ignoring the fact that our fellow Black men, women, and children are being gunned down, terrorized, and targeted. This is racism. This is terrorism. This is unacceptable. When did we become okay with Americans killing Americans? When did we think it was okay for almost 40% of our population to live in constant fear? You cannot stay silent. We cannot stay silent. We all need to speak up – no matter what color our skin might be. You have to say something, educate, and STOP standing silently on the side. Engage in meaningful conversation, ask thoughtful questions, speak the truth that racism must be stopped. Be an ally. If we do not stand together to make this change, this change will not happen. If you are white and you do not stand with us, change will not happen. Watch and listen to my friend, A’Driane, of Butterfly Confessions. I was honored to be able to meet her in person last year at BlogHer’s Voices of the Year. Her piece, “America’s Not Here For Us,” had a profound impact on me. We are lucky to have a voice like hers that is not afraid to speak up about the hard things and her unwavering commitment to people of color. 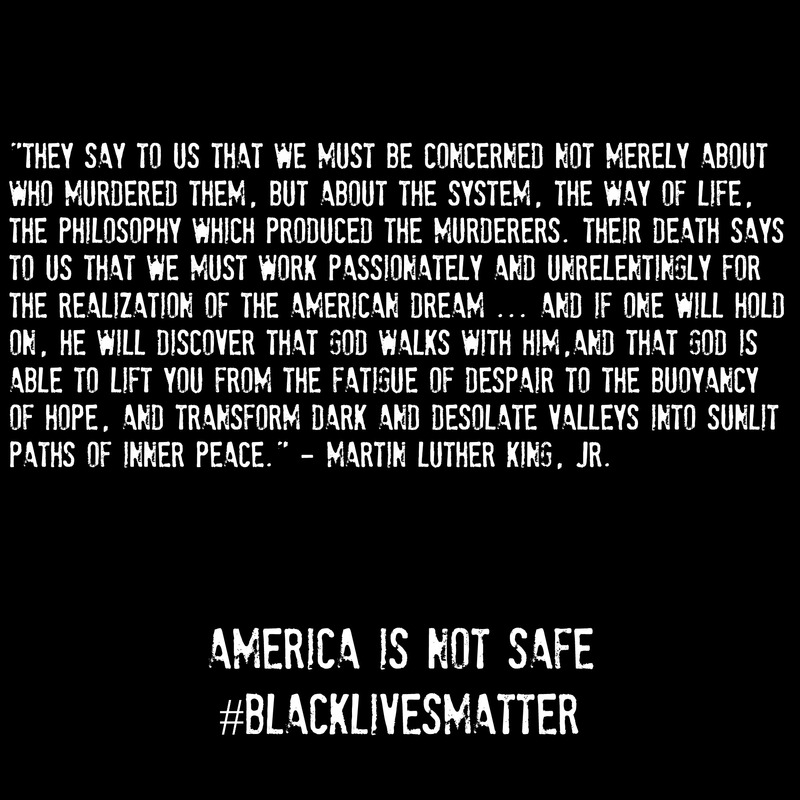 Let’s not rest until ALL of America feels safe because #BlackLivesMatter. Thanks for posting this, Phyllis. I hear you. You know that my family was pulled over for Driving While Black. Pulled over by a cop — but what if we were forced to stop by someone with a much more serious grudge against people of color? The outcome could’ve been very different. Yes – it’s scary when the cops pull you over, but even more when it’s just someone who is hating.